Today, the Belgian business magazines Trends Tendances (in French) and Trends (in Dutch) published a story about SCHMOOZY FOX's Funky Brands™ philosophy. In this story, I define Funky Brands as remarkable products which stand out from the crowd due to their astonishing design and smart brand strategy. I talk about not-too-funky companies which compete solely on cost, discuss what kinds of products have the potential of becoming funky, and mention examples of existing Funky Brands – Ice Watch, Theo, Vespa, NewTree and Mini. 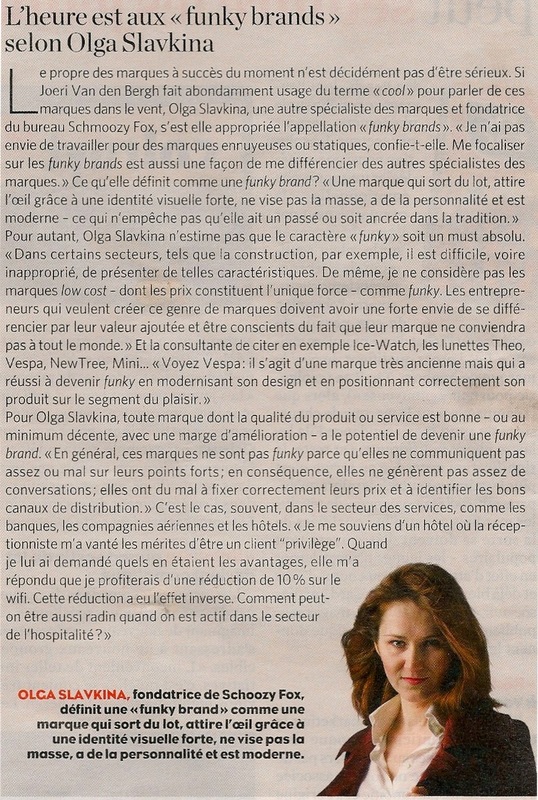 Below you can see an article in French which was written by editor of Trends Tendances, Camille van Vyve. The photo in the article is by Michael Chia, a Brussels-based photographer whom I interviewed before.